Chattahoochee High School's ICE (Indian Cultural Exchange) Club, with the Talented and Gifted (TAG) Department's Ms. Kathy Whitley, learned about Ekal Vidyalaya's mission and donated to fund a dollar-a-day school in India for a year. On April 9th, in its last meeting for the 2012-2013 school year, Chattahoochee High School’s ICE (Indian Cultural Exchange) Club presented a check for $365 to Ekal Vidyalaya. The ICE students were proud and happy that their contribution would open and run an Ekal school in a tribal village in India for an entire year! The club’s mission is to educate and entertain students with various aspects of Indian culture. Through the club website (www.hoochiceclub.com), meetings, and events, this young organization has become one of the most popular clubs in Chattahoochee High School. Wanting to volunteer and give back to the community, the club approached Ekal and after a presentation by Ekal, the club donated funds for basic education of nearly 20 to 30 children. 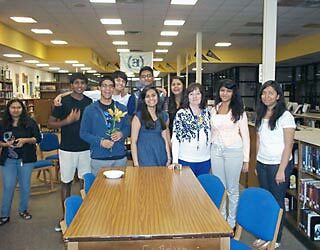 Left: Chattahoochee High School's ICE (Indian Cultural Exchange) Club, with the Talented and Gifted (TAG) Department's Ms. Kathy Whitley, learned about Ekal Vidyalaya's mission and donated to fund a dollar-a-day school in India for a year. School Principal Mr. Tim Duncan lauded the efforts of the ICE Club and shared his vision and ideas for organizing other cultural programs and raising more funds for this worthwhile cause. He saw this as a wonderful volunteering opportunity not merely for the ICE Club but for other school students to contribute to the education of others while they themselves are getting an education.